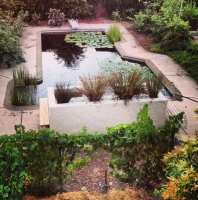 The Pool to Pond conversion was part of a 2/3 acre Permaculture Design Project in Chico, CA. 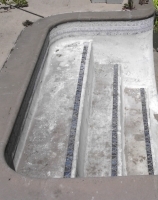 The project began in 2009 and 2011 the pool to pond conversion began. The Permaculture Project is detailed on a separate page. 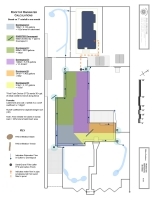 The design and implementation this particular phase of the project entailed the conversion of ~22,000 gallon swimming pool into an aquaculture pond for fish production, habitat, aquaponics and irrigation. Rooftop rainwater was filtered before entering the pond and a custom built 3 chambered biofilter kept the water clean and clear. 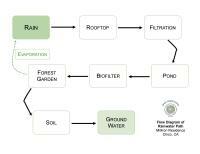 In any rainfall event where water from the pond may overflow the sides of the pond it was made to, instead, move into the forest garden's infiltration trenches and basins in a closed loop system. 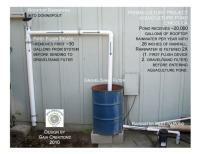 Rainwater enters to pond via a series of filtration devices. First the rainwater enters a first flush device which removes the first 30 gallons of rainwater from the system -the dirty water moves out into the landscape. Next the rainwater moves into a pipe which sends it to a gravel/sand filter housed inside a 55 gallon drum. 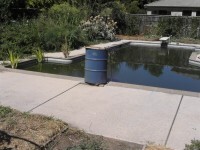 After this rainwater is further cleansed it moves into the pond utilizing the existing pool plumbing. The roofwater and pond water has been tested repeatedly for heavy metals and were found to be non-detectable. These images show how we created edges (niches) habitat for baby fish, insects and more. 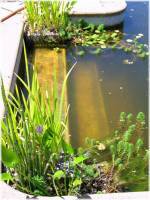 The bottom of the pond was terraced with rocks, cinder block, gravel and sand. It's imperative to create as much edge for habitat as possible. 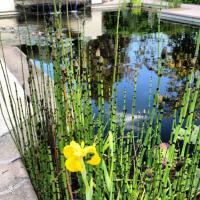 The more edge that is created in the water and surrounding the pond the more diverse the system will become. The amount and size of available edge effects the potential diversity of the pond too -particularly a swimming pool conversion as most pools intentionally lack surface area for living things to grow upon. 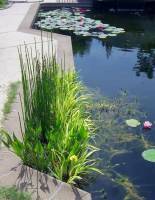 The swim steps were filled with emergent aquatic plants (stems and leaves are above water) while the the still usable steps into the pond are also home to emergent aquatic plants and mosquito fish -when the bass aren't eating them all! The biofilter cleanses over 5000 gallons per day. A pump submersed on the other end of the pond pumps water into the biofilter (through a pipe you can just see to right of the biofilter in the first image) at a cost of about $11 per month. 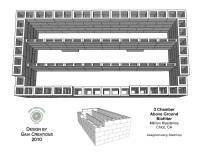 In the biofilter design there are 3 chambers water fills until the weir (not in the design), slightly angled toward the pond, allows the filtered water to fall about 3 feet into the pond -aiding the oxygenation of the water. A backsplash garden box was installed this year to capture any water the wind blows back toward the biofilter.